8-10 long, thin ‘Turkish’ peppers, or, 2 large green peppers ( but not chillies !!) sliced. 120 – 150 gm feta. Heat your oven to about 190 degrees and put in a large dish to warm up. First skin the tomatoes. To do this, put them whole into a basin and cover with boiling water. Prick each one once and leave for a minute or two. Drain them and when cool enough to handle slip off the skins. Cut each of the tomatoes in half and remove the seeds. Chop the remaining flesh, so that you have a fine dice. In a frying pan, heat the olive oil and when hot, add the sliced peppers and gently fry for a few minutes. Add the garlic and the diced tomatoes. Add salt and pepper – go easy on the salt, as the feta is salty. Depending on which type of peppers you have used, you may have to add some dried chilli flakes. What you are trying to achieve is a warm spicy dish – hot enough to make it moreish, but not so hot it blows your socks off! 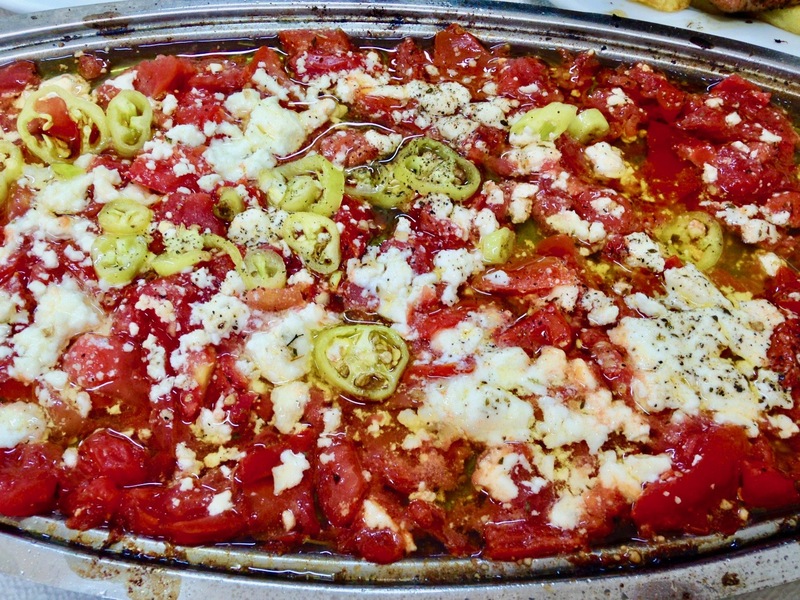 Now put your tomato, pepper mixture into the dish, warming in the oven, crumble over the feta, drizzle with a little oil, and return the dish to the oven. 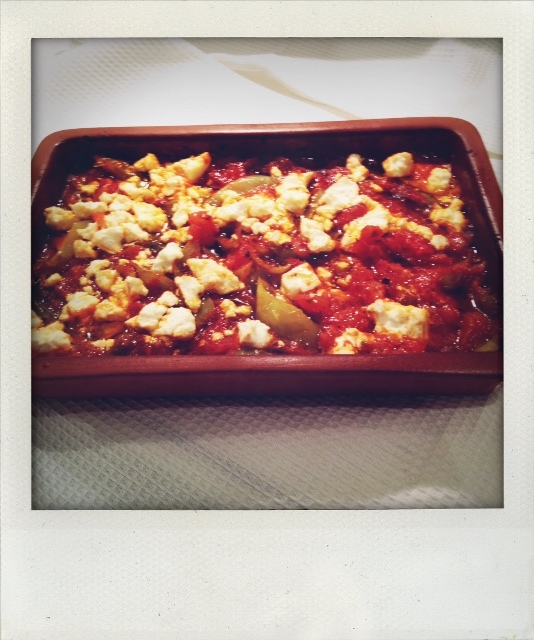 Bake for about 15 minutes until the feta has softened. Serve as part of a mezé selection.